When she finds herself running out of money, Pamela (aka P.L. Travers) finally gives in to Walt’s request to come to Los Angeles and work with his team of creative minds to make a film based on her bestselling book. Reluctantly, Pamela gets on a plane and once she reaches Disney Studios she is to collaborate with the famously brilliant composers Robert and Richard Sherman (B.J. Novak and Jason Schwartzman) along with screenwriter Don DaGradi (Bradley Whitford). The interaction between Pamela and the team of filmmakers is hilarious as the author systematically rejects just about each and every idea presented to her on how to bring her book to life. Getting wind of the fact that the stubborn and cranky author is not on board with most of the creative process, Walt Disney puts his charm to work to win her over by infusing her with everything Disney. Much to his dismay, Walt discovers that not only is Pamela staunchly against everything Disney, she is nauseated by the idea that her beloved characters, which she refers to as family, could potentially be brought to life through animation and music. As the present day story continues, director John Lee Hancock takes us through a series of flash backs into to Pamela’s tragic childhood in Australia. We see a young Pamela (Annie Rose Buckley) enamored by Travers Guff (Collin Farrell), her handsome, charming, and mischievous father. In her eyes her father was perfect and could do no wrong. But, in reality he was an alcoholic that could not hold down a job and cared little about the negative effect he was having on his wife and children. Getting a look into Pamela’s sad past will make the audience empathetic towards the writer as well as give us insight to her motives for writing “Mary Poppins” and why she is so protective and passionate about her prized work. As Walt Disney studies Pamela, he slowly makes the discovery that her fears and motivations for holding on to her story so tightly are rooted in her childhood. We also learn through the film that Walt’s 20 year quest was driven by a promise he made to his daughters to bring the classic tale to life and (as he states throughout the movie) he never goes back on a promise. To help Pamela feel more connected to him, Walt reveals the difficulties of his childhood and how he relates to the “Mary Poppins” story. Emma Thompson couldn’t be more perfect as P.L. Travers. The seasoned actress pulls off the stiff, stodgy and snobbish English woman to perfection. To top it off, with her folded arms and tight lips, Thompson is very funny portraying the unyielding storyteller. True to form, Tom Hanks is great in this film. Capturing Walt Disney’s charm and tenacity, Hanks brings the charismatic icon to life as his character deals with the frustrations of winning over the inflexible Travers. Collin Farrell gives one of the best performances of his career as the emotionally damaged alcoholic father that is the inspiration for the Mr. Banks character in “Mary Poppins”. Annie Rose Buckley is an added bonus playing the young Pamela and will pull at your heartstrings portraying the little girl that just wanted her daddy to be okay. Adding to the supporting cast is Paul Giamatti as the lovable limo driver Ralph, Ruth Wilson as Pamela’s distraught mother, and Rachel Griffiths as the strong Aunt Ellie who will be the inspiration for the Mary Poppins personality. 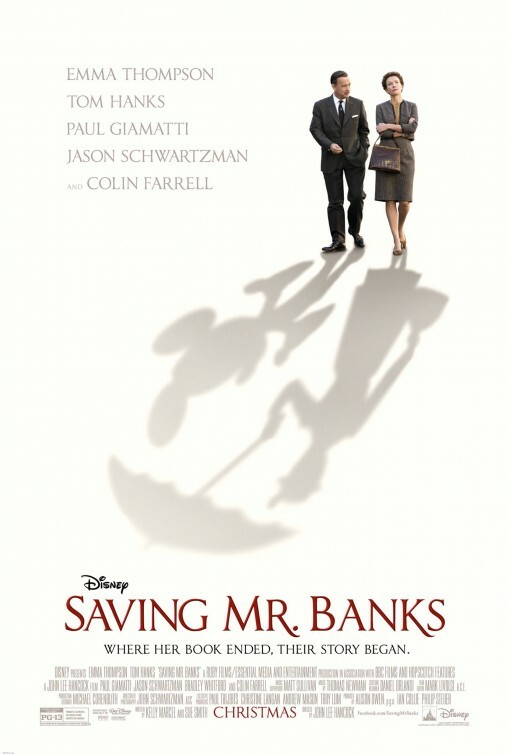 Dialogue loaded with humor that also unveils the secrets of a woman haunted by her past, the script for SAVING MR. BANKS is written beautifully. In keeping with Disney tradition, this is a film loaded with touches of Disney magic and emotional moments that are done so nicely so that the film never comes across sappy. As we really get to know what makes P.L. Travers tick, many watching this film will probably feel the sniffles coming on… so be sure to take plenty of tissue paper to the theatre.